Update: This article has been superseded by more recent analysis on the 1.5C carbon budget and also the budgets within the IPCC special report on 1.5C. In its most recent synthesis report, published in early 2014, the Intergovernmental Panel on Climate Change (IPCC) laid out estimates of how much CO2 we can emit and still keep global average temperature rise to no more than 1.5C, 2C or 3C above pre-industrial levels. That same year, Carbon Brief used these estimates to calculate how many years of current emissions were left before blowing these budgets. Updating this analysis for 2016, our figures suggest that just five years of CO2 emissions at current levels would be enough to use up the carbon budget for a good chance – a 66% probability – of keeping global temperature rise below 1.5C. The IPCC estimates carbon budgets for 1.5C, 2C and 3C. For each temperature limit there are three budgets. The first gives a 66% probability of staying below the given temperature, the second a 50% chance, and the last a 33% chance. Carbon budget: A carbon budget is the maximum amount of carbon that can be released into the atmosphere while keeping a reasonable chance of staying below a given temperature rise. The Intergovernmental Panel on Climate Change (IPCC) first adopted the concept of carbon budgets in its 2013 report. Budgets are typically expressed in gigatonnes of carbon (GtC) or carbon dioxide (GtCO2). To convert the former to the latter, multiply by 3.67. Strictly speaking, these aren’t probabilities, but are the proportion of all the model simulations that keep warming below that temperature limit. The IPCC’s synthesis report presented the total carbon budget from the beginning of the industrial revolution and said what was remaining, as of the beginning of 2011. Using data from the Global Carbon Project, Carbon Brief has brought these budgets up to date. In 2015, for example, worldwide CO2 emissions from fossil fuel burning, cement production and land use change were 39.7bn tonnes – slightly lower than the 40.3bn from 2014. As of the beginning of 2011, the carbon budget for a 66% chance of staying below 1.5C was 400bn tonnes. Emissions between 2011 and 2015 mean this has almost halved to 205bn tonnes. The result is that, as of the beginning of 2016, five years and two months of current CO2 emissions would use up the 1.5C budget. As it is now May, this means there are now fewer than five years remaining before the budget is blown. So, if the current rate of emissions continues, the 1.5C budget would be used up sometime in 2021. The equivalent remaining budgets for a 66% chance of staying below 2C and 3C are 20 years and three months, and 55 years and six months (respectively) of current emissions. You can see all the budgets in our updated graphic at the top of the article, and the full spreadsheet with data sources here. 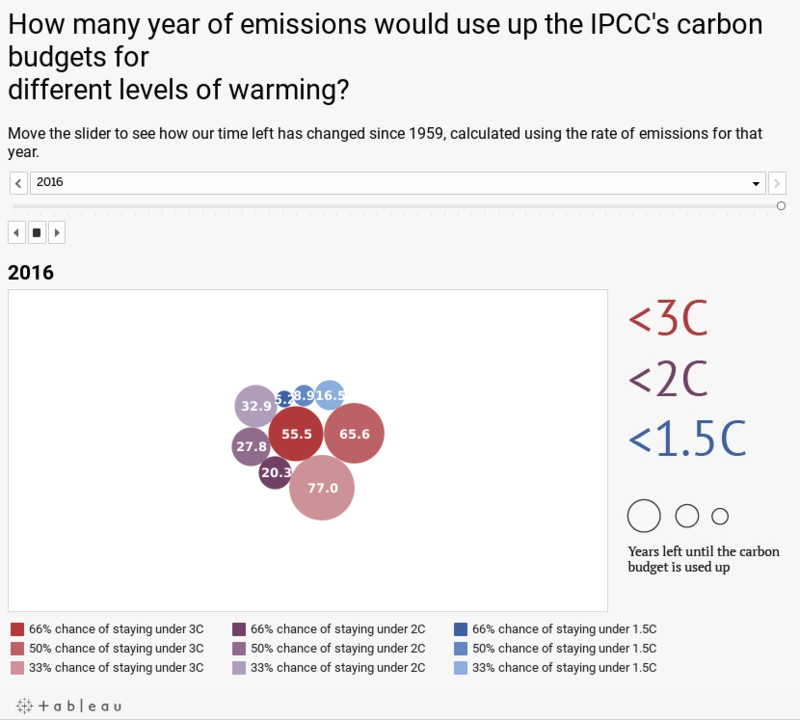 You can explore how the 1.5C, 2C and 3C carbon budgets have changed over time in the interactive chart below. Use the slider to move from 1959 to 2016. And we’ve also created an animation of how the different carbon budgets have shrunk – starting at the Earth Summit in Rio in 1992 and finishing when 1.5C budget is expected to be used up in 2021. Note that we calculate the remaining carbon budget in any one year by assuming that annual emissions from that point continue at the same level. This means that on some occasions the budget actually increases from one year to the next. This happens when a dip in annual global emissions means the reduction in cumulative emissions in future years is larger than the amount of CO2 removed from the budget for that year. It’s worth noting that there’s more than one way to construct a carbon budget. A paper published in Nature Climate Change earlier this year looked at the different approaches and their relative merits. The simplest budget is one that only considers CO2. CO2 has a near-linear relationship with temperature. This means every tonne of CO2 emitted to the atmosphere makes roughly the same contribution to global temperatures. It allows scientists to make a relatively simple estimate of the cumulative CO2 emissions that would produce a particular amount of warming – say, 1.5C or 2C. However, we don’t only emit CO2 into the atmosphere. We also emit methane, nitrous oxide, ozone, hydrofluorocarbons, and a host of other greenhouse gases. These all have different warming impacts on the planet and different lifetimes in the atmosphere. Remaining carbon budgets from 1870 (top section) and 2011 (bottom section) in billions of tonnes of CO2. Credit: Table 2.2 of IPCC AR5 synthesis report. The first is the snappily-titled “threshold exceedance budget”, or “TEB” for short. These are the type used for the “Complex models, RCP only scenarios” rows in the IPCC table. To calculate a TEB, scientists simulate global temperatures in Earth system models according to a pathway of future emissions that considers all greenhouse gases. Scientists run the model until global temperature rise crosses a given threshold – say 1.5C. They then work out the cumulative CO2 in the atmosphere at that point – and this is the carbon budget. The other gases are, therefore, taken into account when calculating how the Earth’s climate reached 1.5C of warming, but the resulting budget is still only expressed in CO2. The TEB is the approach used to calculate the carbon budget we presented above. In the IPCC’s calculations, they assume emissions continue along the RCP8.5 pathway – where greenhouse gas emissions aren’t curbed – and simulate the impact on global temperatures in 20 different models. The second approach for carbon budgets that take other gases into account is the “TAB”, or “Threshold Avoidance Budget”. These are the type used for the “Simple model, WGIII scenarios” rows in the IPCC table above. In calculating TABs, scientists simulate many scenarios in a simple model and only pick scenarios that don’t exceed the temperature in question. From these scenarios, they then estimate a carbon budget for staying below that temperature. Therefore, rather than using one scenario in lots of models, the TAB approach uses lots of scenarios in one model. However, as most scientists have been working on how to keep temperatures below 2C or 3C, there aren’t very many scenarios for 1.5C. For example, there is no IPCC budget using this approach that has a 66% chance of keeping below 1.5C. Many of the scenarios that do keep temperature rise below 1.5C assume application of negative emissions technologies to help offset emissions from human activities. These technologies, such as bioenergy with carbon capture and storage (BECCS), remove CO2 from the atmosphere and store it on land, underground or in the oceans. However, as Carbon Brief recently explored in our negative emissions series, questions still remain over the feasibility of large-scale application of these technologies. One of the reasons why there are so few IPCC scenarios that keep temperatures consistently below 1.5C is that many allow for a situation in which emissions overshoot the 1.5C budget, and are brought back in line later through the use of negative emissions. The lack of available scenarios has also been identified as a key challenge for authors of the planned IPCC special report on 1.5C. Future scenario work is expected to remedy this gap, says Rogelj, as more scenarios in line with 1.5C are being published. Main image: 1.5C carbon budget graphic. Credit: Rosamund Pearce for Carbon Brief. This article was updated on 19/05/2016 to include two paragraphs on negative emissions. Infographics | April 4. 2017. Infographics | April 4. 2018. Q&A: Has the UK blown its green power budget? Infographics | July 7. 2015. Infographics | July 7. 2018. Infographics | November 11. 2016.